What happens when time runs out on debt? Most all debt has a statute of limitations – with the exception of federal student loans. 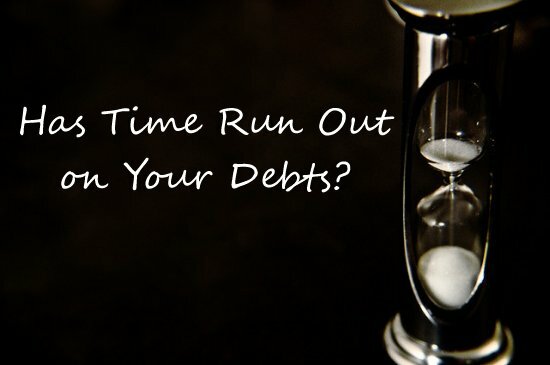 A statute of limitations sets the time limit for how long a creditor can sue you over a debt. In North Carolina, most consumer debt has a statute of limitations of three years from the date of last activity. The last activity would typically be the last time you charged something on the account or the last time you made a payment on the account. Here’s what you need to know about debt that has expired the statute of limitations – known as “time-barred debt” – so you don’t get taken advantage of by unscrupulous debt collectors. If you last made a payment on a delinquent credit card two years and 11 months ago, the creditor may try and convince you to make a small payment, even as low as $5, and promise to work with you on the debt. By making this seemingly innocuous and modest payment, you reset the clock on the statute of limitations. Where it would have expired in one month, now the creditor has three more years to sue you over the debt. It’s important to know the last date of activity to protect your interests. Even after the statute of limitation expires, the original creditor (i.e. the business you took out the credit with) can continue to ask you for payment. They can call or send letters, but cannot threaten to sue you or make any statements that indicate they have any recourse through the courts to litigate over the debt. In fact, the original creditor can continue to try and collect on debt indefinitely. But after three years from the last payment, they have no legal teeth and after seven years, it falls off your credit. In North Carolina, debt buyers are prohibited from collecting on debts aged beyond the statute of limitations. These are firms that specialize in collecting debts and who purchase debt from creditors at a highly discounted rate then attempt to collect on them. Collection agencies acting on behalf of the original creditor are not barred from collecting so long as they have no purchased the debt from the original creditor. You may have to ask questions to find out if they purchased the debt. Just because you know that the statute of limitations is expired does not mean the courts know. If a debt buyer, creditor or collection agency files a lawsuit against you over a delinquent debt, you should still respond to the lawsuit. Your response should include the defense that the statute of limitations has expired on the debt and list the date of your last payment to substantiate this claim. If you do not file a response, the court can issue a summary judgment for your failure to respond. If you are deep in debt and unable to pay your bills, debt collections may have become a distressing fact of life you cope with on a daily basis. Filing for Chapter 7 bankruptcy will discharge most unsecured debts including credit cards, medical bills, and open balances on old utility bills, foreclosed mortgages or auto loans. Once a debt is discharged through bankruptcy, the creditor or debt collector is permanently barred from collections activity. They cannot call, cannot write or sue you over it. To find out more about the fresh financial start bankruptcy offers, contact the Law Offices of John T. Orcutt today. Call 1-888-234-4181 for a free North Carolina bankruptcy consultation at one of our offices in Raleigh, Durham, Fayetteville, Wilson, Greensboro, Garner or Wilmington.